Born in Birkenhead, Alex started his career at Tranmere Rovers, turning professional in 1999. He made his debut some two years later and went on the make over 50 appearances for the club. During his time at Prenton Park, Alex enjoyed successful loan spells at Altrincham (October 2000) and Morecambe (January 2002) where he scored four goals in a 5-0 thrashing of Gresley Rovers. He stayed at Morecambe until the end of the season. In his time at Tranmere he also played with ex-Diamond Paul Hall who recommended the club to him following his release at the end of the 2003 / 2004 season. He joined Diamonds on 24 May 2004, becoming one of Ernie Tippett’s first signings. He struggled to find the net on a regular basis for Diamonds, only scoring three times in 46 appearances. Although he was given a long run in the side at the start of the season, once Barry Hunter took charge of the side he was not selected as a first choice striker on too many occasions. 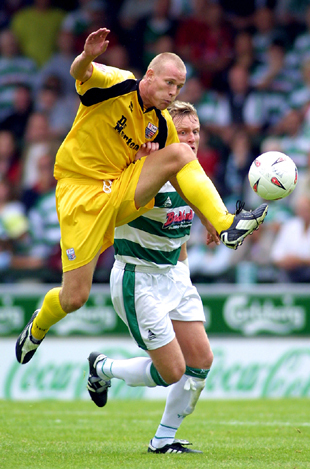 He was released after just one season and after an unsuccessful trial at Accrington Stanley, joined Bangor City in August 2005, but left mid-season to join Vauxhall Motors. In June 2006, he returned to Wales and joined Rhyl for the season, before joining Cammell Laird of the Northern Premier the following season (2007/2008). After two years, Alex returned to Wales, joining Northern Premier Division One North side Colwyn Bay on 19 June 2009. On 8 November 2009, he took up the post of player/manager with his former club Cammell Laird (now in the Northern Premier Division One South) at the age of just 28, but resigned from his position on 16 November 2010. He became chief scout for Chester in September 2011. After scouting appointments at Tranmere Rovers, Eastleigh and Stockport County he became chief scout with AFC Fylde in 2016.